Yes, that's right. Today is all about me. Become my minions or perish. 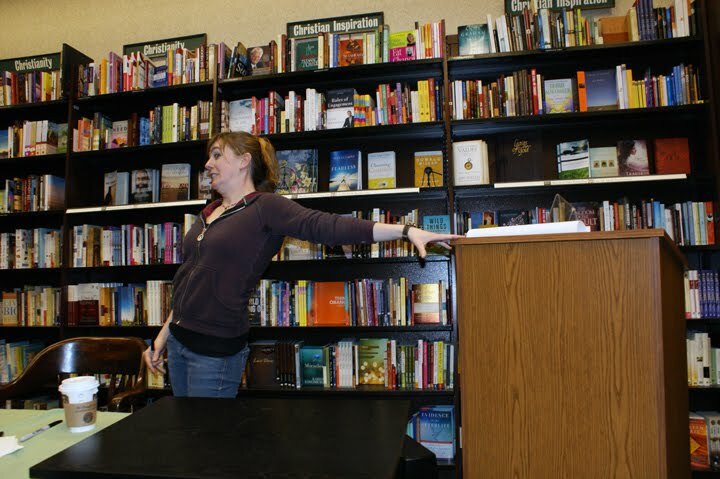 Okay, so maybe it wasn't quite like that, but a signing with Maggie Stiefvater is never a tame event. Randomness and shenanigans are always part of the experience, and what starts out as an on-topic conversation about books can quickly degrade, but that's all part of the fun. 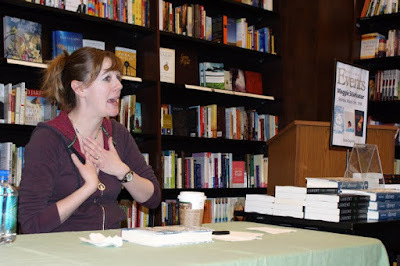 Maggie's signing at the Barnes & Noble in Charlottesville, Virginia, last Saturday (March 13) was no exception. Maggie fans of all ages showed up to catch a glimpse of the best selling author, packing tight into a corner of the bookstore to listen to her speak. 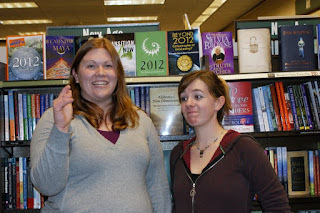 I met up with Monica from Bibliophilic Book Blog and we befriended Laura from Tattooed Books at the event. Of course one of the first questions she answered was, "Where do you get your ideas?" She explained that they start out as little nagging thoughts and slowly grow. Sometimes writing a short story just to put the idea down on paper and quiet the voices. Other times, they become so loud that something more is necessary. That was the case with Maggie's NYT best seller SHIVER. Maggie said the voice got rather impatient with that particular idea. "Maggie Stiefvater," it boomed. "Write a book about werewolves and kissing." After talking about her books, she shared some stories about her travels. Including one about a security guard at the Newark airport who thought Maggie intended to take out a plane with her terrorist sketch book. All this because it had a metal latch on it. 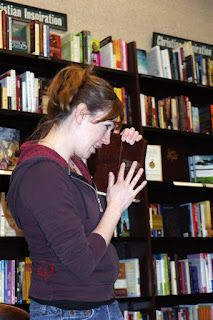 Too your left, you will see Maggie with the afforementioned "Sketch Book of Doom." While she signed books and bookplates and doodled in several people's books, there was talk of critiquing and revisions and the Merry Sisters of Fate, a short fiction site that Maggie and her critique partners Brenna Yovanoff (THE REPLACEMENT, Razorbill 2010) and Tessa Gratton (BLOOD MAGIC, Random House 2011) post to regularly. Maggie even reenacted her meeting with author M.T. 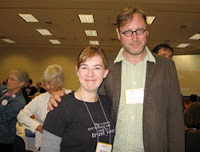 Anderson at the Midwest Bookseller's Association annual meeting last fall where Publisher's Weekly snapped a photo of them chatting. On the left is Maggie playing M.T. Anderson and a podium standing in for Maggie. On the right is the actual shot, which is not quite as marked, but his face is priceless. As the signing began to wind down, casual conversation with Maggie continued. Everything from the recent surge in zombie books to Loki's new stereo system was fair game. (Loki is Maggie's camaro for those who don't know.) 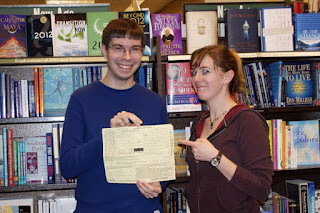 That was about the time James from Book Chic Club rolled in, speeding ticket in hand. Awful right? Yes, but this is not a first for our beloved boy blogger. Oh no. He's broken the law to get to Maggie before, and you can read about that incident here. "NYT best seller. I win." A copy of Ballad, the sequel to Lament, is up for grabs! It's signed AND Maggie doodled the King of the Dead just inside the cover, so some lucky reader with not only have her autograph, but also some of her artwork. You have to be a blog follower, and leave a comment on this post to enter. Extra entry opportunities are listed below. Don't forget to include your e-mail and links to tweets/posts, and tally your entries in your comment. Contest closes on April 10 at midnight EST . Maggie seems hilarious! I hope I get to meet her some day. Wow! Sounds like a fun signing! GREAT contest! Thank you so much for the chance to win this!! I'm an old blog follower on Google. I linked on my blog. It's on the right sidebar under Current Contests: www.thedoortowonderland.blogspot.com. I just met Maggie today! Unfortunately, it was a bunch of authors, and she was only there for 45 minutes, but she was such a sweetheart! I had a great time at the signing as well! It was wonderful to befriend you too. You'll get that picture someday. Hopefully we'll get to meet again soon. Haha, this post made me laugh. I love Maggie's sense of humor. Your photo with her is a classic! Love it. Now, for the serious stuff :oP Thank you so much for making this international! Lucky you! Maggie sounds awesome, I'd love to meet her. Might have to jump on a plane to the US sometime soon! I loved Shiver, she has such a beautiful way of writing. I so want to read Lament and Ballad now! 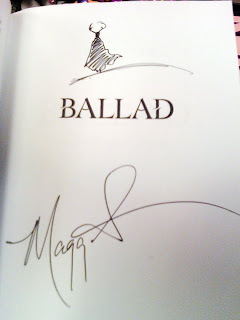 I'm dying to read Ballad! Thank you for making this contest international! Also, great pics. I think you should post a lot of the unseen pics on like Flickr or something. I want to see them. Maggie's so funny, esp. in your pictures. Maggie seems like a fun person!! thankyou so much for making it international!! Oh, enter me please! : ) I would love this book... her doodle is awesome. I follow the blog. Great contest, please enter me! I'm a new follower, love your blog and the contest! HIYA!! Pleased to meet you - and I adore your blog layout!!! +2 Also followed you on twitter. Count me in. I am a new follower and your blog is great-looks nice and is easy to read. I love Maggie!! Thanks for the giveaway!! Okay, I'm not entering (already have a signed copy bc I'm sweet like that), but just wanted to say that you're pretty hilarious. And Maggie's pretty awesome. And I just want to hang out with both of you sometime. I love Ballad!! and with a doodle is priceless!!! Awesome contest and I LOVE your blog name! I loved reading your post about Maggie! :) And of course, great contest! By my count that's 9 entries, but I may be wrong :) Or is it 10 if you count this comment? :) Either way, THANK YOU! So, that would be 7 total including the extra entries. LOVED meeting you in Charlottesville!!! What a great opportunity to be able to meet Maggie in person!! I am a new follower, and I'm RTing this on Twitter. I love reading about authors with such fun personalities. Those pictures completely capture the FUN of this event and I am SO jealous!! New follower. +3 Thanks for the chance! Sounds like an amazing signing! Glad you had a good time. How cool, I would love to be included. That sounds like a fun book signing! I love Maggie's drawings. Did you see the guitar she drew free hand on not that long ago on her blog. AMAZING!!!! Wow, very cool. And the doodle is awesome. I always love a multi-talented author! I have never been to a book signing as I live in a rural area and there are only small bookshops around. It sounds like you really enjoyed it and I hope someday to also attend one. Thank you so much for letting me have a go! +3 Follower (Old) - my follower name is Cherry. +2 Follow @wastepaperprose on Twitter - my twitter name is @cherrymischivus. upsi! i forgot! Im internartional reader! HI! a big thank you! i love maggie!! +1 Tweet about the contest. I've been wanting to read Ballad forever!!!!!! I'm an old follower and I follow you on twitter too! Please enter me! I just found this blog and I am totally in love with it already. I love your header image! Maggie seems like an AWESOME person! I wish I could meet her! Hehe. Maggie sounds like a blast! Can't wait to read the book! Such a cool contest! I'd love to enter. Sounds like a great time. Maggie seems like a great person, I'd love to get to meet her. Oh my oh my! WOW WOW WOW! Thank you soooo much for this chance! +1 tweeted about the contest. +3 Follower - I'm new! thanks for the giveaway! maggie stiefvater is amazing! OMG I want it so bad! I'm a follower, I follow you on twitter too :) I've retweeted about your contest. Would love to enter to have something signed by Maggie! That was a great post! Looks like Maggie is really funny! I'd love to win this contest! Loved Ballad. Maggie is awesome. I believe that is 7 entries! Thanks so much for the opportunity to win something so amazing!